The Lake Caroline, VA area has had 0 reports of on-the-ground hail by trained spotters, and has been under severe weather warnings 8 times during the past 12 months. Doppler radar has detected hail at or near Lake Caroline, VA on 24 occasions, including 4 occasions during the past year. 4/19/2019 1:55 PM EDT At 154 pm edt, a severe thunderstorm was located over bowling green, moving north at 60 mph (radar indicated). Hazards include 60 mph wind gusts. Expect damage to trees and powerlines. this severe storm will be near, port royal around 200 pm edt. other locations impacted by this severe thunderstorm include rappahannock academy, beazley, sparta, golansville, villboro, hustle, potomac beach, guinea, corbin and elevon. A tornado watch remains in effect until midnight edt for north central and east central virginia. 4/19/2019 1:35 PM EDT At 134 pm edt, a severe thunderstorm was located over kings dominion, or near ashland, moving north at 55 mph (radar indicated). Hazards include 60 mph wind gusts. Expect damage to trees and powerlines. this severe thunderstorm will be near, milford around 150 pm edt. bowling green around 155 pm edt. fort a. p. hill around 200 pm edt. port royal around 205 pm edt. other locations impacted by this severe thunderstorm include beazley, golansville, hustle, potomac beach, guinea, corbin, elevon, supply, penola and nancy wrights corner. A tornado watch remains in effect until midnight edt for central, north central and east central virginia. 6/24/2018 4:20 PM EDT At 420 pm edt, severe thunderstorms were located along a line extending from near massaponax to near milford to near ladysmith to near montpelier, moving east at 40 mph (radar indicated). Hazards include 60 mph wind gusts and quarter size hail. Minor damage to vehicles is possible. expect wind damage to trees and powerlines. these severe storms will be near, milford around 425 pm edt. bowling green around 430 pm edt. fort a. p. hill around 435 pm edt. 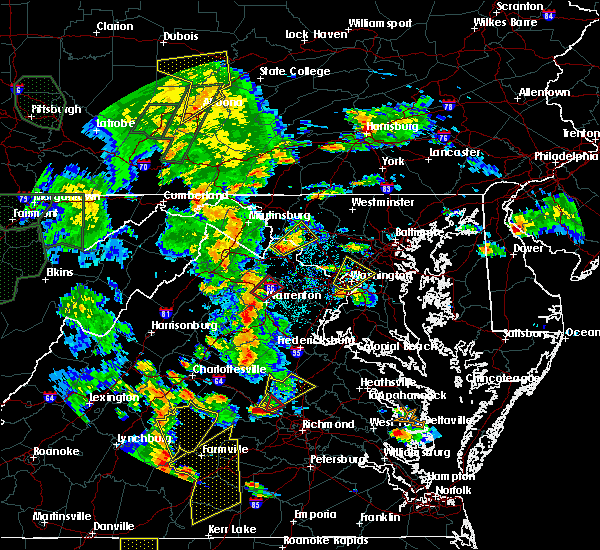 ashland, randolph macon college, port royal and kings dominion around 440 pm edt. hanover and dawn around 445 pm edt. Other locations impacted by these severe thunderstorms include rappahannock academy, chilesburg, sparta, golansville, villboro, oliver, guinea, corbin, gum tree and coatesville. 6/24/2018 4:05 PM EDT At 405 pm edt, severe thunderstorms were located along a line extending from near spotsylvania to near ladysmith to near bumpass to 6 miles northeast of hadensville, moving east at 35 mph (radar indicated). Hazards include 60 mph wind gusts and quarter size hail. Minor damage to vehicles is possible. expect wind damage to trees and powerlines. severe thunderstorms will be near, ladysmith around 415 pm edt. milford and montpelier around 425 pm edt. bowling green and fort a. p. hill around 430 pm edt. port royal around 435 pm edt. ashland and randolph macon college around 440 pm edt. hanover, kings dominion and dawn around 445 pm edt. Other locations impacted by these severe thunderstorms include chilesburg, golansville, guinea, corbin, gum tree, penola, gilman, nancy wrights corner, cedar fork and ruther glen. 5/14/2018 7:17 PM EDT At 717 pm edt, severe thunderstorms were located along a line extending from nanjemoy creek to near ladysmith to new canton, moving east at 50 mph (radar indicated). Hazards include 60 mph wind gusts and quarter size hail. Minor damage to vehicles is possible. expect wind damage to trees and powerlines. these severe storms will be near, ladysmith around 720 pm edt. 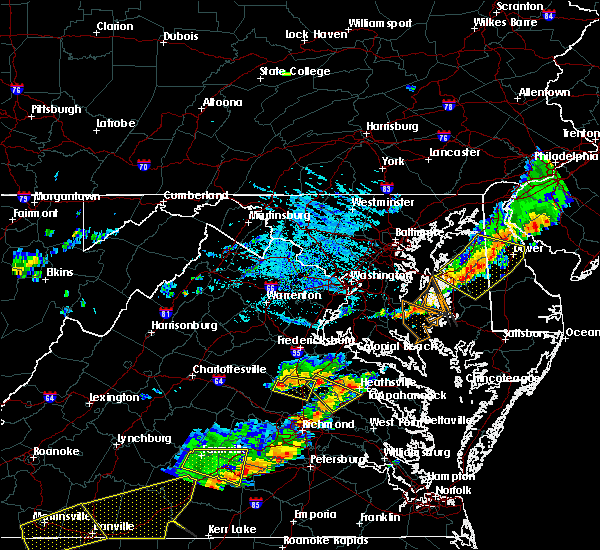 milford and kings dominion around 725 pm edt. fife and dawn around 730 pm edt. oilville around 745 pm edt. Other locations impacted by these severe thunderstorms include chilesburg, orchid, gum tree, three square, central plains, bremo bluff, west view, nancy wrights corner, ruther glen and wilmington. 5/14/2018 7:02 PM EDT At 702 pm edt, severe thunderstorms were located along a line extending from near aquia creek to near bumpass to near centenary, moving east at 50 mph (radar indicated). Hazards include 60 mph wind gusts and penny size hail. Expect damage to trees and powerlines. 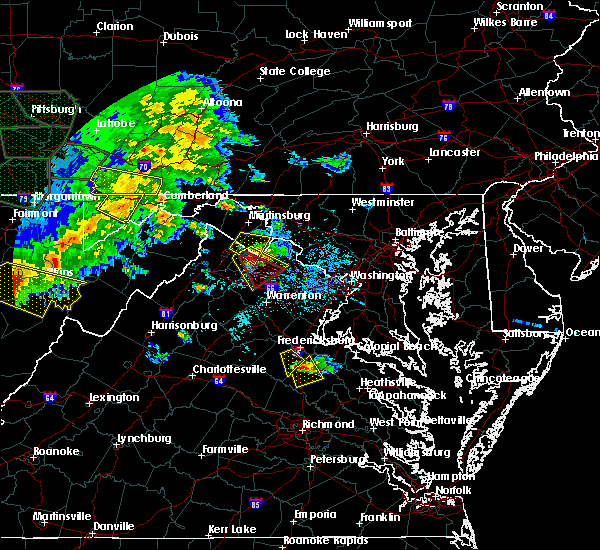 severe thunderstorms will be near, bumpass around 705 pm edt. fork union and ladysmith around 715 pm edt. milford around 720 pm edt. columbia, dawn and kings dominion around 725 pm edt. fife around 730 pm edt. oilville around 745 pm edt. Other locations impacted by these severe thunderstorms include chilesburg, orchid, gum tree, three square, central plains, bremo bluff, west view, nancy wrights corner, wares crossroads and ruther glen. 5/10/2018 4:01 PM EDT At 400 pm edt, a severe thunderstorm was located near montpelier, or 11 miles northwest of randolph macon college, moving east at 45 mph. additional strong to severe storms were located near cedar fork, moving east at 40 mph (radar indicated). Hazards include 60 mph wind gusts and quarter size hail. Minor damage to vehicles is possible. expect wind damage to trees and powerlines. Locations impacted include, ladysmith, kings dominion, chilesburg, golansville, oliver, gum tree, coatesville, hewlett, doswell, noel, beaverdam, burruss corner, cedar fork and ruther glen. 5/10/2018 3:30 PM EDT At 330 pm edt, a severe thunderstorm was located over bumpass, or 7 miles east of mineral, moving east at 30 mph (radar indicated). Hazards include 60 mph wind gusts and quarter size hail. Minor damage to vehicles is possible. expect wind damage to trees and powerlines. this severe thunderstorm will be near, ladysmith around 400 pm edt. 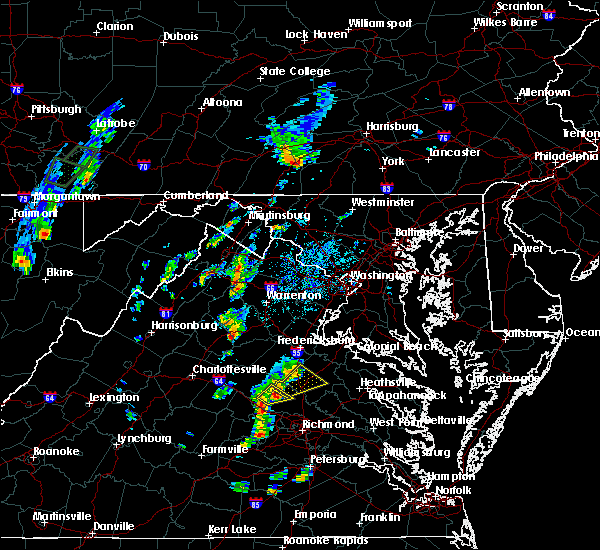 kings dominion around 415 pm edt. Other locations impacted by this severe thunderstorm include chilesburg, golansville, oliver, gum tree, coatesville, hewlett, doswell, noel, beaverdam and burruss corner. 8/18/2017 7:13 PM EDT At 713 pm edt, a severe thunderstorm was located near milford, moving east at 50 mph (radar indicated). Hazards include 60 mph wind gusts. Expect damage to trees and powerlines. this severe thunderstorm will be near, fort a. p. hill around 725 pm edt. port royal around 730 pm edt. champlain, leedstown and loretto around 740 pm edt. montross and newland around 750 pm edt. Other locations impacted by this severe thunderstorm include beazley, golansville, hustle, elevon, supply, penola, stratford hall, cedon, lerty and sparta. 6/19/2017 6:25 PM EDT At 624 pm edt, severe thunderstorms were located along a line extending from near gum spring to near powhatan, moving east at 45 mph (radar indicated). Hazards include 60 mph wind gusts and quarter size hail. Minor damage to vehicles is possible. expect wind damage to trees and powerlines. severe thunderstorms will be near, manakin, sabot and montpelier around 635 pm edt. tuckahoe around 640 pm edt. wyndham around 645 pm edt. ashland around 650 pm edt. 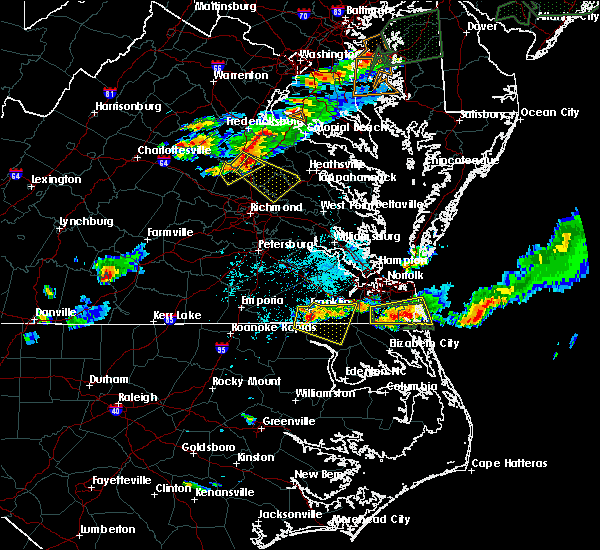 randolph macon college, lakeside, laurel, glen allen and kings dominion around 655 pm edt. mechanicsville, east highland park and dawn around 700 pm edt. milford and hanover around 705 pm edt. Other locations impacted by these severe thunderstorms include golansville, vontay, gum tree, johnsons springs, elmont, penola, gilman, solomons store, chamberlayne and atlee. 5/27/2017 6:17 PM EDT At 617 pm edt, a severe thunderstorm was located 8 miles northeast of montpelier, or 11 miles northwest of randolph macon college, moving southeast at 30 mph (radar indicated). Hazards include 60 mph wind gusts and quarter size hail. Minor damage to vehicles is possible. expect wind damage to trees and powerlines. This severe thunderstorm will remain over mainly rural areas of east central louisa, southwestern caroline and northwestern hanover counties, including the following locations: chilesburg, golansville, oliver, gum tree, coatesville, hewlett, goodall, doswell, penola and noel. 5/27/2017 5:48 PM EDT At 547 pm edt, a severe thunderstorm was located near mineral, moving southeast at 30 mph (radar indicated). Hazards include 60 mph wind gusts and quarter size hail. Minor damage to vehicles is possible. expect wind damage to trees and powerlines. 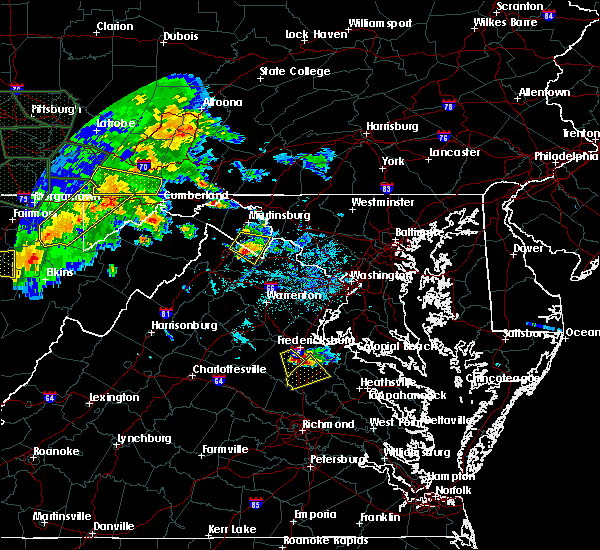 this severe thunderstorm will be near, bumpass around 600 pm edt. montpelier around 620 pm edt. Other locations impacted by this severe thunderstorm include chilesburg, golansville, pendleton, oliver, gum tree, coatesville, hewlett, goodall, doswell and penola. 5/5/2017 6:27 PM EDT At 627 pm edt, a severe thunderstorm was located near ladysmith, or 11 miles west of milford, moving northeast at 30 mph (radar indicated). Hazards include 60 mph wind gusts and quarter size hail. Minor damage to vehicles is possible. expect wind damage to trees and powerlines. this severe thunderstorm will be near, ladysmith around 635 pm edt. bowling green around 655 pm edt. Other locations impacted by this severe thunderstorm include rappahannock academy, chilesburg, golansville, villboro, nancy wrights corner, guinea, corbin, cedar fork, ruther glen and woodford. 5/5/2017 6:03 PM EDT At 602 pm edt, a severe thunderstorm was located near bumpass, or 14 miles northwest of randolph macon college, moving northeast at 35 mph (radar indicated). Hazards include 60 mph wind gusts and quarter size hail. Minor damage to vehicles is possible. expect wind damage to trees and powerlines. this severe thunderstorm will be near, ladysmith around 625 pm edt. bowling green and milford around 630 pm edt. Other locations impacted by this severe thunderstorm include chilesburg, golansville, beaverdam, nancy wrights corner, cedar fork, coatesville, hewlett, ruther glen, penola and noel. 2/25/2017 2:50 PM EST At 250 pm est, a severe thunderstorm was located 7 miles northwest of kings dominion, or 10 miles northwest of randolph macon college, moving northeast at 45 mph (radar indicated). Hazards include 60 mph wind gusts and half dollar size hail. Hail damage to vehicles is expected. expect wind damage to roofs, siding, and trees. this severe thunderstorm will be near, bowling green and milford around 310 pm est. fort a. p. hill around 320 pm est. port royal around 325 pm est. champlain and loretto around 330 pm est. Other locations impacted by this severe thunderstorm include rappahannock academy, sparta, golansville, hustle, oliver, elevon, supply, coatesville, central point and hewlett. 7/19/2016 3:37 PM EDT At 337 pm edt, a severe thunderstorm was located over ladysmith, or 8 miles west of milford, moving southeast at 25 mph (radar indicated). Hazards include 70 mph wind gusts and ping pong ball size hail. People and animals outdoors will be injured. expect hail damage to roofs, siding, windows, and vehicles. expect considerable tree damage. wind damage is also likely to mobile homes, roofs, and outbuildings. this severe storm will be near, milford around 350 pm edt. 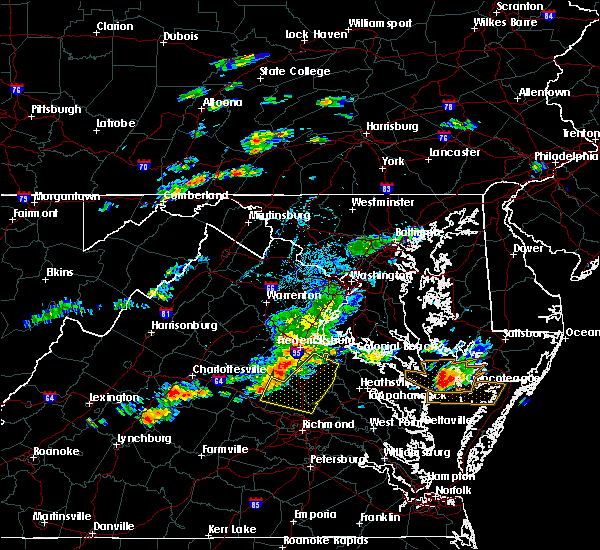 kings dominion around 400 pm edt. other locations impacted by this severe thunderstorm include cedar fork, woodford, golansville, sparta, burruss corner, gum tree, cedon, hewlett, guinea and noel. precautionary/preparedness actions, for your protection move to an interior room on the lowest floor of a building. 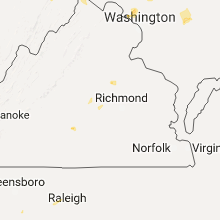 please send your reports of hail and or wind damage, including trees or large limbs downed, by calling noaa`s national weather service in wakefield at , 7 5 7, 8 9 9, 2 4 1 5. 7/19/2016 3:16 PM EDT At 315 pm edt, a severe thunderstorm was located near spotsylvania, or 12 miles northwest of milford, moving southeast at 35 mph (radar indicated). Hazards include 60 mph wind gusts and quarter size hail. Hail damage to vehicles is expected. expect wind damage to roofs, siding, and trees. this severe thunderstorm will be near, ladysmith around 325 pm edt. bowling green and milford around 335 pm edt. Other locations impacted by this severe thunderstorm include cedar fork, woodford, golansville, sparta, burruss corner, gum tree, cedon, hewlett, guinea and noel. 7/1/2016 7:00 PM EDT At 700 pm edt, a severe thunderstorm was located near ladysmith, or 7 miles southwest of milford, moving southeast at 30 mph (radar indicated). Hazards include 60 mph wind gusts and quarter size hail. Hail damage to vehicles is expected. expect wind damage to roofs, siding, and trees. this severe thunderstorm will be near, kings dominion around 710 pm edt. dawn around 715 pm edt. hanover and mangohick around 725 pm edt. beulahville around 730 pm edt. saint stephens church and aylett around 745 pm edt. Other locations impacted by this severe thunderstorm include upshaw, cedar fork, doswell, pollards corner, duane fork, turpin, golansville, epworth, globe and burruss corner. 7/1/2016 6:55 PM EDT At 654 pm edt, a severe thunderstorm was located near ladysmith, or 11 miles west of milford, moving southeast at 15 mph (radar indicated). Hazards include 60 mph wind gusts and quarter size hail. Hail damage to vehicles is expected. expect wind damage to roofs, siding, and trees. this severe thunderstorm will remain over mainly rural areas of west central caroline and northwestern hanover counties, including the following locations: cedon, coatesville, cedar fork, beaverdam, hewlett, chilesburg, golansville, noel, nancy wrights corner and ruther glen. precautionary/preparedness actions, for your protection move to an interior room on the lowest floor of a building. please send your reports of hail and or wind damage, including trees or large limbs downed, by calling noaa`s national weather service in wakefield at , 7 5 7, 8 9 9, 2 4 1 5. 7/1/2016 6:37 PM EDT At 636 pm edt, a severe thunderstorm was located near ladysmith, or 14 miles west of milford, moving southeast at 15 mph (radar indicated). Hazards include 60 mph wind gusts and penny size hail. Expect damage to roofs. siding. and trees. this severe thunderstorm will be near, ladysmith around 700 pm edt. Other locations impacted by this severe thunderstorm include penola, cedon, coatesville, cedar fork, beaverdam, hewlett, chilesburg, golansville, noel and nancy wrights corner. 6/16/2016 9:11 PM EDT At 911 pm edt, a severe thunderstorm capable of producing a tornado was located 7 miles northwest of kings dominion, or 9 miles north of randolph macon college, moving southeast at 15 mph (radar indicated rotation). Hazards include tornado and two inch hail. Flying debris will be dangerous to those caught without shelter. mobile homes will be damaged or destroyed. damage to roofs, windows, and vehicles will occur. tree damage is likely. this dangerous storm will be near, ashland, randolph macon college and kings dominion around 930 pm edt. other locations impacted by this tornadic thunderstorm include gum tree, oliver, penola, coatesville, cedar fork, hewlett, doswell, golansville, noel and ruther glen. precautionary/preparedness actions, take cover now! move to a basement or an interior room on the lowest floor of a sturdy building. avoid windows. if you are outdoors, in a mobile home, or in a vehicle, move to the closest substantial shelter and protect yourself from flying debris. please send your reports of hail and or wind damage, including trees or large limbs downed, by calling noaa`s national weather service in wakefield at , 7 5 7, 8 9 9, 2 4 1 5. 6/16/2016 8:57 PM EDT At 857 pm edt, a severe thunderstorm capable of producing a tornado was located 7 miles southwest of ladysmith, or 12 miles northwest of randolph macon college, moving southeast at 20 mph (radar indicated rotation). Hazards include tornado and hail up to two inches in diameter. Flying debris will be dangerous to those caught without shelter. mobile homes will be damaged or destroyed. damage to roofs, windows, and vehicles will occur. tree damage is likely. this dangerous storm will be near, ashland, randolph macon college and kings dominion around 925 pm edt. Other locations impacted by this tornadic thunderstorm include gum tree, oliver, penola, coatesville, cedar fork, beaverdam, hewlett, doswell, chilesburg and golansville. 6/16/2016 8:55 PM EDT At 854 pm edt, severe thunderstorms were located along a line extending from near quantico to near kents store, moving east at 40 mph (radar indicated). Hazards include 60 mph wind gusts and quarter size hail. Hail damage to vehicles is expected. expect wind damage to roofs, siding, and trees. severe thunderstorms will be near, montpelier around 925 pm edt. wyndham around 930 pm edt. ashland and randolph macon college around 935 pm edt. glen allen around 940 pm edt. hanover around 945 pm edt. Other locations impacted by these severe thunderstorms include supply, elevon, hustle, woodford, pendleton, sparta, burruss corner, cedon, hewlett and guinea. 6/16/2016 8:53 PM EDT At 853 pm edt, a severe thunderstorm was located near ladysmith, or 12 miles southwest of milford, moving southeast at 25 mph (radar indicated). Hazards include two inch hail and 70 mph wind gusts. People and animals outdoors will be injured. expect hail damage to roofs, siding, windows, and vehicles. expect considerable tree damage. wind damage is also likely to mobile homes, roofs, and outbuildings. locations impacted include, bowling green, milford, ladysmith, oliver, cedar fork, beaverdam, doswell, chilesburg, golansville, gilman, penola, cedon, coatesville, hewlett, noel, nancy wrights corner and ruther glen. precautionary/preparedness actions, this thunderstorm is capable of producing all types of severe weather including extremely large hail, destructive straight line winds and tornadoes. move quickly to a safe shelter, such as an interior room, a bathroom or closet or basement. torrential rainfall is occurring with this storm, and may lead to flash flooding. do not drive your vehicle through flooded roadways. 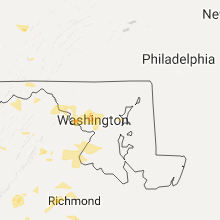 please send your reports of hail and or wind damage, including trees or large limbs downed, by calling noaa`s national weather service in wakefield at , 7 5 7, 8 9 9, 2 4 1 5. 6/16/2016 8:27 PM EDT At 827 pm edt, a severe thunderstorm was located over bumpass, or 9 miles east of mineral, moving southeast at 30 mph (radar indicated). Hazards include two inch hail and 70 mph wind gusts. People and animals outdoors will be injured. expect hail damage to roofs, siding, windows, and vehicles. expect considerable tree damage. wind damage is also likely to mobile homes, roofs, and outbuildings. This severe thunderstorm will remain over mainly rural areas of southwestern caroline and northwestern hanover counties, including the following locations: oliver, cedar fork, beaverdam, doswell, chilesburg, golansville, gilman, penola, cedon and coatesville. 6/16/2016 5:56 PM EDT At 556 pm edt, a severe thunderstorm was located near massaponax, or 8 miles northwest of bowling green, moving south at 20 mph (radar indicated). Hazards include 60 mph wind gusts and quarter size hail. Hail damage to vehicles is expected. expect wind damage to roofs, siding, and trees. this severe storm will be near, bowling green, milford and ladysmith around 615 pm edt. Other locations impacted by this severe thunderstorm include golansville, cedon, nancy wrights corner, guinea and woodford. 6/16/2016 5:41 PM EDT At 541 pm edt, a severe thunderstorm was located near massaponax, or 10 miles northwest of bowling green, moving south at 30 mph (trained weather spotters). Hazards include 60 mph wind gusts and quarter size hail. Hail damage to vehicles is expected. expect wind damage to roofs, siding, and trees. this severe storm will be near, bowling green and ladysmith around 555 pm edt. milford around 600 pm edt. Other locations impacted by this severe thunderstorm include corbin, cedon, guinea, woodford, golansville, nancy wrights corner and villboro. 6/16/2016 5:25 PM EDT At 525 pm edt, a severe thunderstorm was located near spotsylvania, or near fredericksburg, moving south at 30 mph (trained weather spotters). Hazards include 60 mph wind gusts and half dollar size hail. Hail damage to vehicles is expected. expect wind damage to roofs, siding, and trees. this severe thunderstorm will be near, bowling green and ladysmith around 555 pm edt. milford around 600 pm edt. Other locations impacted by this severe thunderstorm include corbin, cedon, cedar fork, chilesburg, guinea, woodford, golansville, nancy wrights corner, ruther glen and villboro. 2/24/2016 6:01 PM EST At 601 pm est, doppler radar indicated a severe thunderstorm capable of producing a tornado. this dangerous storm was located over spotsylvania, or 10 miles south of fredericksburg, moving northeast at 60 mph. locations impacted include, bowling green, milford, ladysmith, oliver, cedar fork, chilesburg, woodford, golansville, penola, cedon, coatesville, hewlett, guinea, noel, nancy wrights corner, ruther glen and villboro. 2/24/2016 5:58 PM EST At 558 pm est, doppler radar indicated a line of severe thunderstorms capable of producing a tornado. these dangerous storms were located along a line extending from near ladysmith to near montpelier, and moving northeast at 75 mph. * these dangerous storms will be near, ladysmith around 610 pm est. milford around 615 pm est. bowling green and fort a.p. hill around 620 pm est. port royal around 625 pm est. other locations impacted by these tornadic storms include oliver, cedar fork, beaverdam, doswell, rappahannock academy, chilesburg, woodford, golansville, burruss corner and corbin. 2/24/2016 5:55 PM EST At 555 pm est, doppler radar indicated a severe thunderstorm capable of producing a tornado. this dangerous storm was located 7 miles south of spotsylvania, or 14 miles west of milford, moving northeast at 60 mph. this tornadic thunderstorm will remain over mainly rural areas of northwestern hanover, east central louisa and northwestern caroline counties, including the following locations: oliver, cedar fork, beaverdam, chilesburg, woodford, golansville, penola, cedon, coatesville and hewlett. 2/24/2016 5:39 PM EST At 538 pm est, doppler radar indicated a tornado. this dangerous storm was located near bumpass, or 9 miles southeast of mineral, and moving northeast at 55 mph. * this dangerous storm will be near, bumpass around 545 pm est. ladysmith around 555 pm est. other locations impacted by this tornadic thunderstorm include oliver, cedar fork, beaverdam, chilesburg, woodford, golansville, fredericks hall, apple grove, maidens and penola. 2/24/2016 5:34 PM EST At 534 pm est, doppler radar indicated a severe thunderstorm capable of producing a tornado. this dangerous storm was located near gum spring, or 8 miles east of hadensville, moving northeast at 55 mph. this dangerous storm will be near, bumpass around 545 pm est. other locations impacted by this tornadic thunderstorm include oliver, cedar fork, beaverdam, chilesburg, golansville, fredericks hall, apple grove, maidens, irwin and coatesville. 2/24/2016 5:22 PM EST At 522 pm est, doppler radar indicated a tornado. this dangerous storm was located near fife, or near goochland, and moving northeast at 55 mph. * this dangerous storm will be near, gum spring around 530 pm est. bumpass around 545 pm est. other locations impacted by this tornadic thunderstorm include cedar fork, golansville, apple grove, maidens, irwin, provost, hewlett, sandy hook, noel and mabelton. 8/11/2015 5:11 PM EDT The severe thunderstorm warning for southwestern caroline and north central hanover counties will expire at 515 pm edt, the severe thunderstorm which prompted the warning has weakened. therefore the warning will be allowed to expire. 8/11/2015 5:03 PM EDT At 502 pm edt, doppler radar indicated a severe thunderstorm capable of producing quarter size hail and damaging winds in excess of 60 mph. this storm was located near ladysmith, or 7 miles southwest of milford, moving east at 30 mph. this severe thunderstorm will remain over mainly rural areas of southwestern caroline and north central hanover counties, including the following locations, golansville, oliver, penola, noel, doswell and burruss corner. 8/11/2015 4:41 PM EDT At 441 pm edt, doppler radar indicated a severe thunderstorm capable of producing quarter size hail and damaging winds in excess of 60 mph. this storm was located near bumpass, or 14 miles east of mineral, and moving east at 30 mph. * this severe thunderstorm will be near, ladysmith around 455 pm edt. 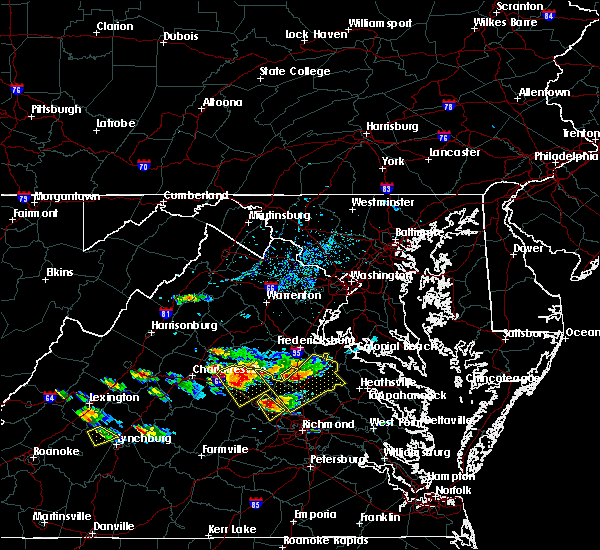 kings dominion around 505 pm edt. other locations impacted by this severe thunderstorm include oliver, penola, coatesville, cedar fork, beaverdam, hewlett, doswell, chilesburg, golansville and noel. 6/27/2015 3:40 PM EDT At 339 pm edt, doppler radar indicated a tornado. this dangerous storm was located near ladysmith, or 8 miles southwest of milford, and moving northeast at 35 mph. * this dangerous storm will be near, milford around 355 pm edt. bowling green around 400 pm edt. fort a.p. hill around 405 pm edt. other locations impacted by this tornadic thunderstorm include golansville, penola, cedar fork, guinea, villboro and woodford. 6/25/2015 9:07 PM EDT At 907 pm edt, doppler radar indicated a line of severe thunderstorms capable of producing quarter size hail and damaging winds in excess of 60 mph. 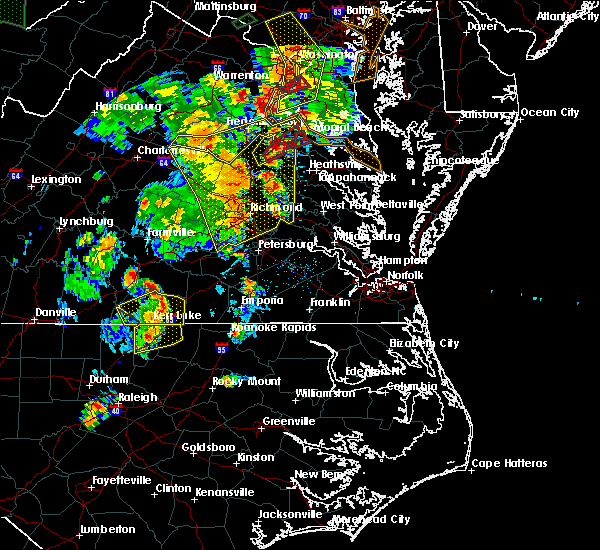 these storms were located along a line extending from near kings dominion to near goochland, moving east at 30 mph. 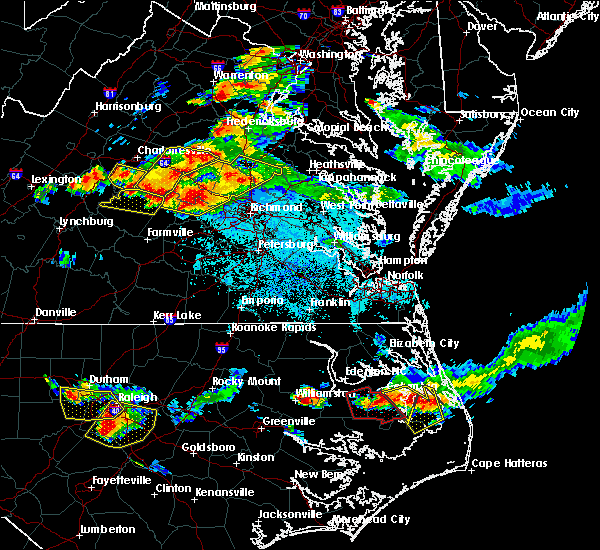 these severe storms will be near, ashland, randolph macon college and kings dominion around 910 pm edt. dawn around 920 pm edt. wyndham around 930 pm edt. other locations impacted by these severe thunderstorms include crozier, jefferson, michaux, maidens, burruss corner, irwin, lake powhatan, provost, hewlett and whiteville. 6/25/2015 8:38 PM EDT At 837 pm edt, doppler radar indicated a line of severe thunderstorms capable of producing quarter size hail and damaging winds in excess of 60 mph. these storms were located along a line extending from near montpelier to lakeside village, and moving east at 30 mph. * severe thunderstorms will be near, montpelier around 845 pm edt. powhatan and goochland around 905 pm edt. ashland and randolph macon college around 910 pm edt. 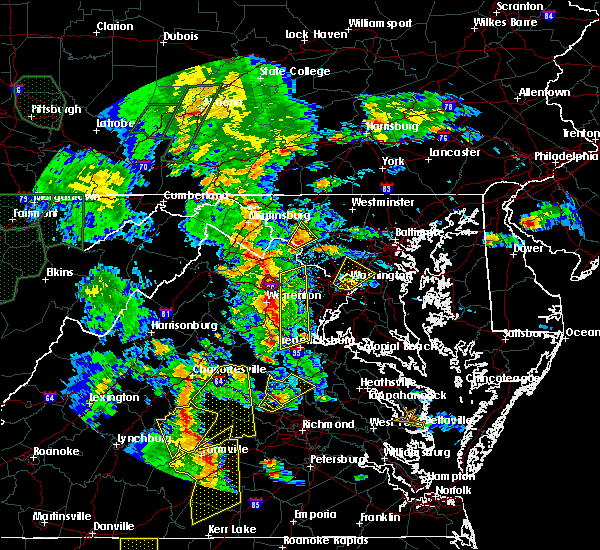 kings dominion and oilville around 915 pm edt. dawn and sabot around 920 pm edt. wyndham around 930 pm edt. other locations impacted by these severe thunderstorms include crozier, jefferson, michaux, maidens, burruss corner, irwin, lake powhatan, provost, hewlett and whiteville. 6/20/2015 8:45 PM EDT At 844 pm edt, doppler radar indicated a line of severe thunderstorms capable of producing damaging winds in excess of 60 mph. these storms were located along a line extending from 8 miles northwest of stafford to near fort a.p. hill to near bottoms bridge, moving northeast at 50 mph. these severe storms will be near, port royal around 850 pm edt. other locations impacted by these severe thunderstorms include supply, upshaw, cedar fork, elevon, pollards corner, duane fork, rumford, hustle, turpin and orapax farms. 6/20/2015 8:24 PM EDT At 823 pm edt, doppler radar indicated a line of severe thunderstorms capable of producing damaging winds in excess of 60 mph. these storms were located along a line extending from 14 miles northwest of spotsylvania to 6 miles southeast of ladysmith to near chesterfield court house, moving northeast at 50 mph. these severe storms will be near, bowling green and milford around 835 pm edt. highland springs and fort a.p. hill around 840 pm edt. bottoms bridge around 845 pm edt. talleysville, port royal and loretto around 850 pm edt. tunstall around 855 pm edt. other locations impacted by these severe thunderstorms include supply, chesterfield, elevon, hustle, turpin, orapax farms, woodford, epworth, sparta and burruss corner. 6/20/2015 8:09 PM EDT At 808 pm edt, doppler radar indicated a line of severe thunderstorms capable of producing damaging winds in excess of 60 mph. these storms were located along a line extending from 8 miles east of orange to near montpelier to 7 miles northwest of sutherland, and moving northeast at 50 mph. * severe thunderstorms will be near, ashland around 815 pm edt. 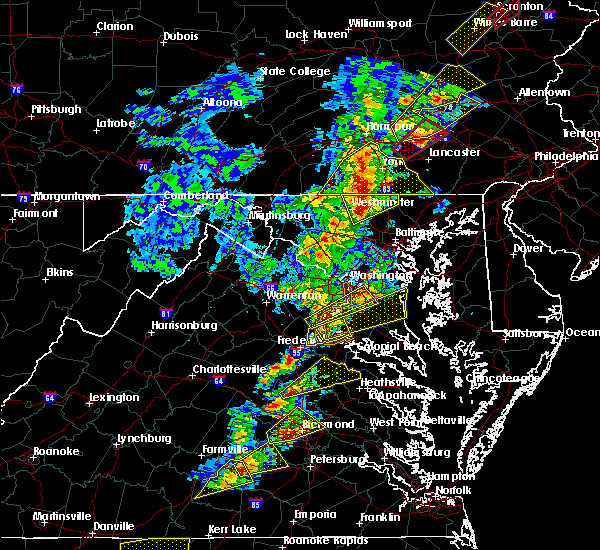 kings dominion around 820 pm edt. chester and ladysmith around 825 pm edt. milford, bellwood and bensley around 830 pm edt. bowling green around 835 pm edt. highland springs and fort a.p. hill around 840 pm edt. bottoms bridge around 845 pm edt. talleysville, port royal, tunstall and loretto around 850 pm edt. other locations impacted by these severe thunderstorms include supply, elevon, hustle, orapax farms, epworth, sparta, maidens, burruss corner, irwin and roslyn hills. 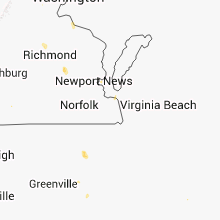 6/20/2015 7:51 PM EDT The severe thunderstorm warning for west central caroline county will expire at 800 pm edt, the storm which prompted the warning has moved out of the area. therefore the warning will be allowed to expire. remember, a severe thunderstorm warning still remains in effect for northern caroline county until 845 pm edt. 6/20/2015 7:42 PM EDT At 742 pm edt, doppler radar indicated a severe thunderstorm capable of producing quarter size hail and destructive winds in excess of 70 mph. this storm was located near ladysmith, or 10 miles southwest of milford, moving northeast at 25 mph. this severe storm will be near, ladysmith around 750 pm edt. other locations impacted by this severe thunderstorm include golansville, ruther glen and cedar fork. 6/20/2015 7:27 PM EDT At 727 pm edt, doppler radar indicated a severe thunderstorm capable of producing quarter size hail and destructive winds in excess of 70 mph. this storm was located near montpelier, or 12 miles northwest of randolph macon college, moving northeast at 30 mph. this severe storm will be near, ladysmith around 745 pm edt. other locations impacted by this severe thunderstorm include coatesville, cedar fork, beaverdam, hewlett, chilesburg, golansville, noel and ruther glen. 6/20/2015 7:12 PM EDT At 711 pm edt, doppler radar indicated a severe thunderstorm capable of producing large hail up to ping pong ball size and destructive winds in excess of 70 mph. this storm was located near montpelier, or 11 miles northeast of goochland, and moving northeast at 25 mph. * this severe thunderstorm will be near, montpelier around 720 pm edt. ladysmith around 755 pm edt. other locations impacted by this severe thunderstorm include oliver, cedar fork, beaverdam, chilesburg, golansville, burruss corner, penola, coatesville, hewlett and vontay.